It was about 85 degrees F today in Austin. 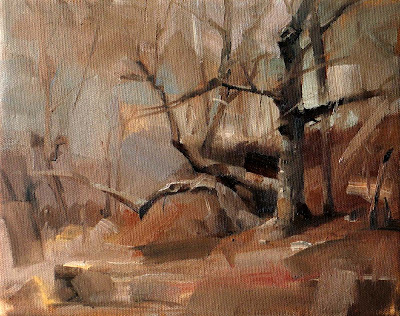 I decided taking the morning off and went to paint landscape with a group plein air painters. I am so glad I did. We were at a place called Apache Shores. It was so beautiful. It was cloudy. I really like the odd shape trees there. BTW, I was lucky to get in the OPA National Show again. This is my second demo at Salado. I am demonstrating art blogging and marketing in front of my students. Everybody is having a great time. This is my first demo I did at the workshop. I am having a wonderful time here: making new friends, enjoy the great weather, and the beauty of this very artsy town. I feel everything slows down here in contrast with my life in Austin. I love it. Hello from Salado Texas. I have just arrived at this beautiful small town. 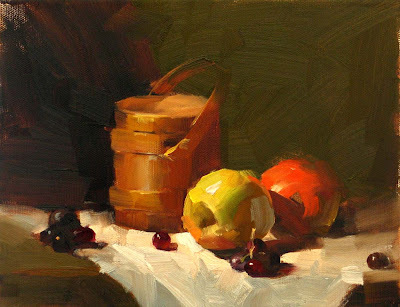 I will teach a workshop here for the next 3 days, and I will share my demo paintings will you. I have not got a chance to paint until yesterday. I did this one last night. You know apple is one of my favorite objects. I had a great fun playing colors on this small canvas. I hope you like it too. The Valentines Day has just passed. The red roses are still blooming on the table. I painted this 9"x 12" to capture this loving moment. I hope you and your valentine have had a wonderful time. May the spirit of the Valentines Day with you forever. 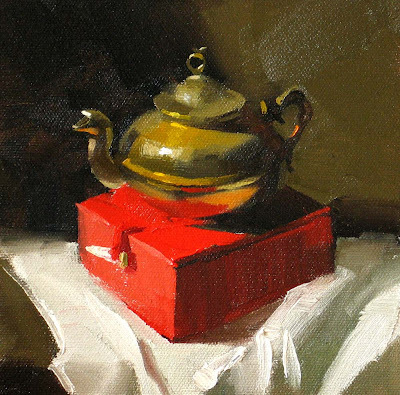 This one I was concentrated on the skills of depicting a metallic surface. The reflections on the small brass thingy were so rich. The perspective needed to be accurate for sure. I spent quite a time on it. It was a very different approach than that I used painting flowers. It was fun but tiresome. This one is very similar to my "Green and Purple" painting. But I was playing with the composition this time, and trying to create a viewing path with grapes. 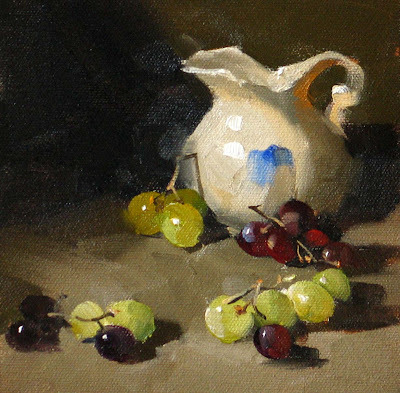 Grapes are wonderful balance adjusters in a still life painting. They are humble, shying away from being the center, but their subtle beauty always shines. They like to help each other to create a harmonious group effect, instead of being conquerors and overpowering the neighbors. I have tried something new last night. This is my first tulip painting. 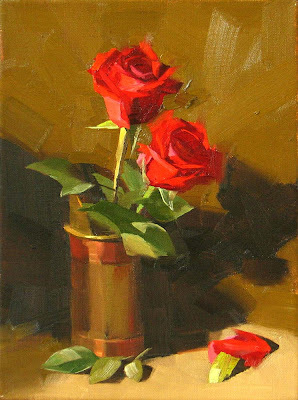 They are relatively easier to paint than other flowers I did, but I had some hard time to get a composition I like. I haven't figured out the way I feel really excited to paint tulips yet, since I don't know the flower well enough. 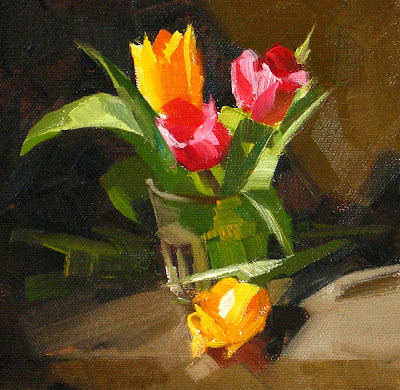 If you know somebody painted great tulips, would you tell me? 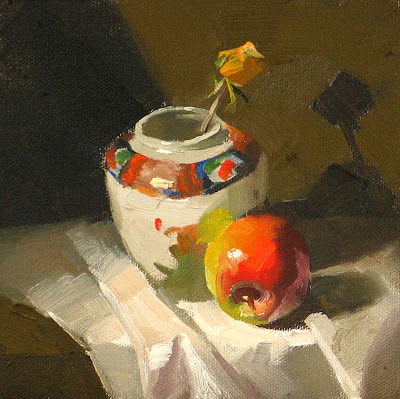 I will teach a 3-day still life painting workshop on February 21 - 23 at Andreeva Portrait Academy at Salado, TX. So far we still have a few openings. Please contact Mr. Chris Coggin at chris@andreevagallery.com to sign up or get detailed information. Sorry about the short notice. Sometimes, painting becomes wishful thinking. My last week was one of those times. I have to work overtime for my engineering job. My painting times got encroached. I finally got time to paint last night. Green and purple are two wonderful colors I would like to use them more. They are kind of complementary, but they have similar color temperatures. Which one is cooler? Hmmm.... It depends. 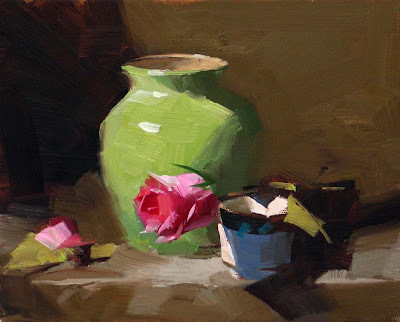 I will teach a 3-day workshop on March 13-15 at Magnolia, TX (north of Houston). 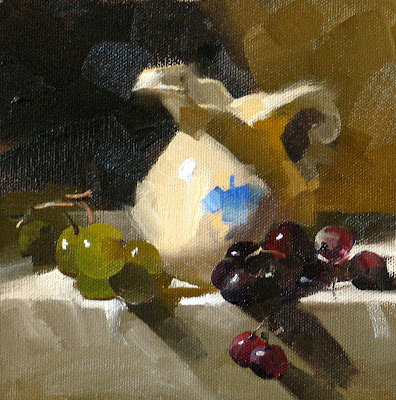 In this workshop, I will spend two and half days on still life painting. In the afternoon of the last day, I will introduce how I conduct a business of art by using the blog and eBay. We still have a few openings for this workshop at this moment. If you are interested in knowing my painting approaches and business process, please contact Ms. Marty Hatcher at mart4art2@sbcglobal.net . With a similar treatment, I did another red rose. I must admit that roses are mysterious. It is a not a complicated flower, but it demonstrates emotions so passionately. Its elegance and freshness can only be presented subconsciously. 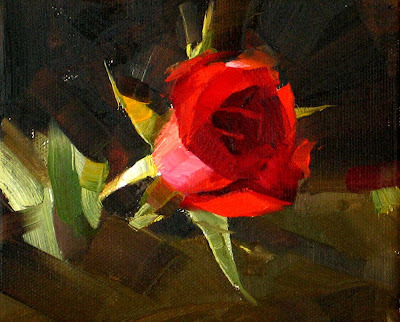 It is no wonder that red roses symbolize the highest level of human emotion - Love.